Pre-climb training and acclimatization at our Base Camp with Tim Rippel - Cost: $3980US. The Trekking Peaks of Nepal gives recreational-climbers an opportunity to tackle a high Himalayan peak without having to be part of a major organized expedition. Although these peaks are lower than their more famous cousins - the 8000-meter peaks - many of the climbs are no less adventurous in nature. Photos: Don Odegaard- "going up" and "going down"
Our Everest Base Camp Trek is no more than a high altitude walk. 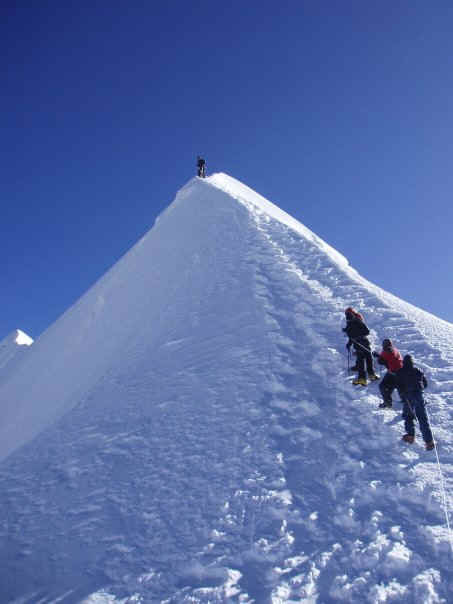 If you want to push higher, bring crampons and an ice axe and add a spectacular Island Peak climb to 6189m to your itinerary. Participants must be in good physical condition. Since previous climbing experience is not essential, having some outdoor background will be useful. Moreover, in order to ensure a safe climbing trip, you are provided basic knowledge on handling ropes as well as about other climbing equipment before starting the actual summit. Take a pick! October 11th each year- Three fantastic itineraries to pick from all in one expedition! The "Triple Crown" is an Everest boot camp or used as general mountaineering course for those who aspire to climb big mountains all while testing skills in the most beautiful mountain range on the planet. 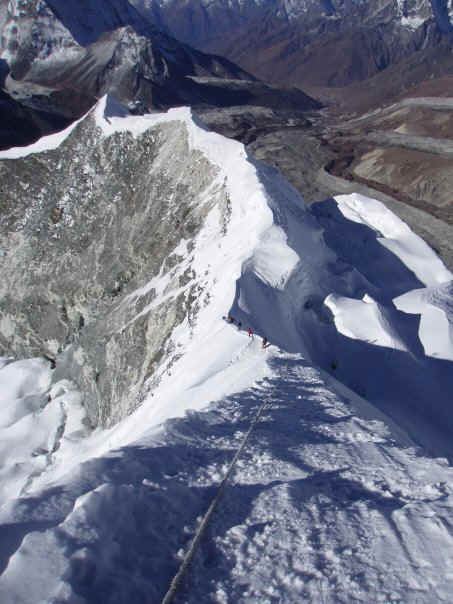 Island Peak is less intense and the only technical aspect is the crossing of one crevasse near the summit. It's an ideal opportunity to test yourself and learn about the use of climbing equipment. Flights from Kathmandu to Lukla and back. 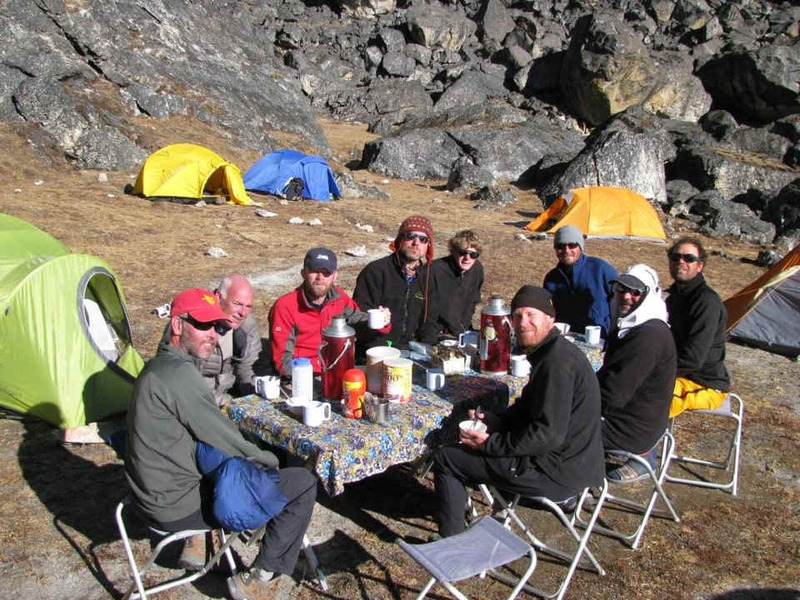 18- Day climb/trek plus technical climbing clinic near Dingboche to hone your skills. 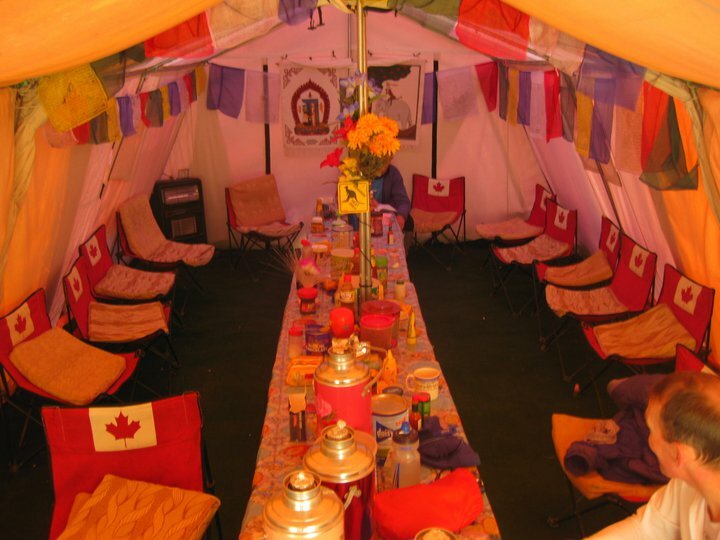 Accommodation in lodges with plus camping in base camp and high camp (if needed, mountain food, tents, base camp facility, camp Sherpa crew. All climbing rope, group technical equipment and other mountain equipment. Support crew Sherpa crew including our team of well equipped porters, yaks, climbing Sherpas and cook. Three meals a day while on trek. For participants without ice axe, harness, helmet and crampons, please ask us and we can organize them for you upon arrival in Kathmandu. A gear list will be forwarded to members once their reservations has been secured and all other pertinent information. Drinks, phone calls, internet, laundry, showers, tips and all other items of a personal nature. Personal climbing and trekking equipment. Personal travel accident insurance- We do rescues but the costs come to you.